River Valley’s Jessica Roush (8) hits a free ball as South Gallia’s Christine Griffith (25), Rachal Colburn (6) and Erin Evans await the return during Wednesday night’s non-league volleyball match in Bidwell, Ohio. BIDWELL, Ohio — As it turned out, the sequel played out almost like the original. And, with a similar ending, the River Valley Lady Raiders outlasted the South Gallia Lady Rebels in five games. For the second time this volleyball season against rival South Gallia, River Valley fell behind by a two-games-to-one margin — only to rally and capture a marathon yet thrilling five-set non-league victory. On Wednesday night, inside a sauna-like River Valley High School gymnasium, the host Raiders stormed back for a 25-16, 23-25, 19-25, 25-19 and 15-12 triumph. That’s correct, as you’ve seen this movie before. In fact, a similar plot panned out in South Gallia’s season opener, when the Raiders invaded on Aug. 22 and fell behind 2-1 — only to charge back for 25-9 and 15-11 wins in the final two games. But that was the Silver and Black’s second contest of the campaign. River Valley book-ended the Rebels’ regular season with another five-set defeat, as the scores were even similar from the initial meeting. The Raiders did lose three more after that, but are now on a two-game win streak, having improved to 5-16. The Lady Rebels, conversely, almost made it back-to-back five-game road wins — having traveled to and prevailed at Wahama on Tuesday night. So close, in fact, that the Rebels rallied in the fifth game from three-point deficits three times (9-6, 10-7 and 12-9) —and forced the set’s sixth and final tie at 12-12. With South Gallia on the serve, River Valley’s Carly Gilmore made a great block, getting middle hitting counterpart Christine Griffith in her attempt to block to hit it out long. That dramatic play gave the serve back to the Raiders, as Caterina Gattinara notched a kill to set up match point, which was accomplished on a Rebels’ hitting error. Gilmore, Gattinara and Kelsey Brown had big games for River Valley, as Gilmore led the way with nine kills and two blocks, as Gattinara and Brown each added seven kills. Rachel Horner had three kills, as Gattinara served up four aces while Gilmore and Brown bagged three apiece. In the first matchup, River Valley won game one 25-13, before the one-sided fourth game and a nip-and-tuck fifth affair. On Wednesday, the Raiders trailed only in game one 1-0 and were tied 1-1, before winning going away at 25-16. In the fourth game, River Valley led wire-to-wire to win 25-19, as the Raiders scored the first four points before eventually doubling their lead to 17-8. South Gallia, which took the second and third games 27-25 and 25-21 in round one, took a 2-1 lead after three again — winning the second set 25-23 and the third 25-19. That set up another intense fifth game, as there were six ties (1-1, 2-2, 3-3, 4-4, 6-6 and 12-12) and two lead changes, with South Gallia’s only lead at 2-1. 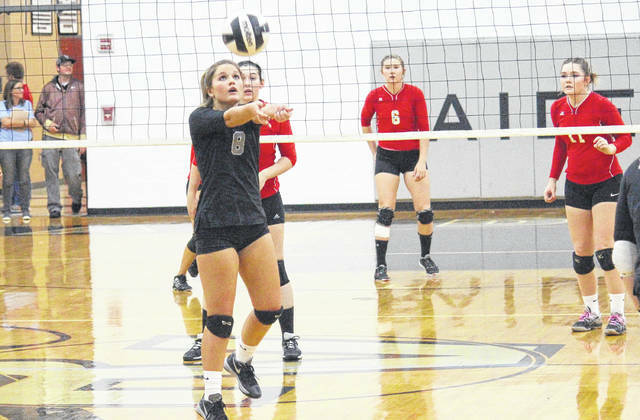 Smith said the key in the fifth set was to try and contain South Gallia standout Rachal Colburn, who dazzled on Wednesday with a match-high 13 kills and nine aces. Entering the last, Colburn had collected 11 kills — and sparked South Gallia by making plays all over the court. Erin Evans amassed 11 kills and five aces for the Rebels, as Griffith gained three kills, while Keirsten Howell and Amaya Howell had three aces apiece. The Rebels forged the 1-1 tie in the second game, following four lead changes and five ties, as South Gallia gained a 13-12 lead which it never relinquished. The Raiders rallied with five of six service points to trail 25-23, but a Colburn kill ended the game. River Valley briefly led 3-2 in the third, but an attack error earned the Rebels a sideout and the second of two ties, before Evans — with four aces in the spree — amounted eight straight service points for an 11-3 advantage. With the Raiders trailing just 21-18, Colburn capped off the game with three more kills, including the one that put South Gallia ahead. The Rebels conclude their regular season at 4-18, and travel to Trimble on Monday for a Division IV sectional semifinal at 6 p.m.
River Valley did close out its league slate, and its regular season, against Alexander on Thursday.